In 1966, Anton LaVey founded the Church of Satan in San Francisco. He would publish the Satanic Bible in 1969. CoS "grottoes" would pop up across the country, though oddly enough it appears that there was not one in Chicago. Instead Chicago had Terry Taylor. 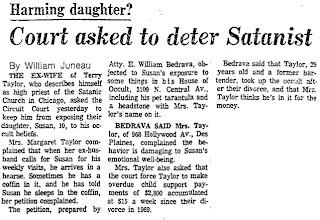 To introduce Taylor, I'll quote from Arthur Lyon's sensationalistic-yet-level-headed 1988 book Satan Wants You. "The Orthodox Satanic Church, in existence from 1971 to 1974 in Chicago, which at its height claimed more than five hundred members, taught a similar system of beliefs (to The Lady of Endor Coven, located in Ohio). The group's anti-LaVey philosophy taught that God the Creator created Satan, who, in turn, became the teacher of all knowledge. 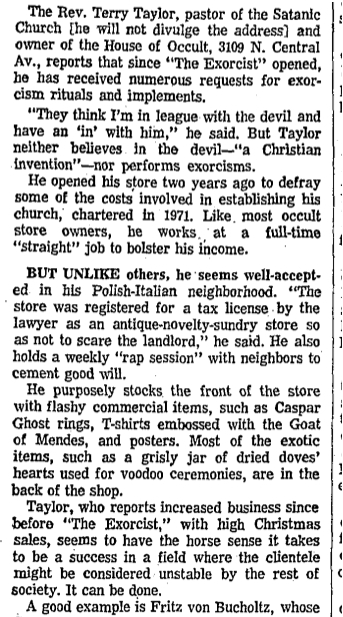 Through ritual, prayer, and songs, held every Saturday night at Chicago's Occult Book Shop (*), members were exhorted to absorb as much of Satan's wisdom as they could. 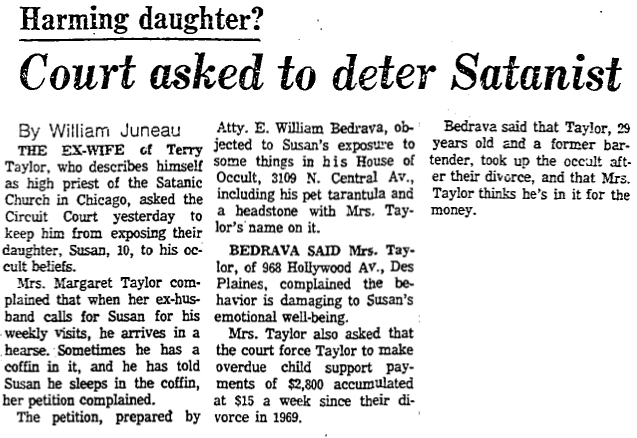 "In 1974, this group broke up after its leader, Terry Taylor, owner of the Occult Book Shop(*) was taken to court by his ex-wife to keep him from bringing his daughter to the cult's rituals. Taylor, she claimed, not only drove the girl to the shop in a hearse but also slept in a coffin. A splinter sect, Thee Satanic Church, was started by Dr. Evelyn Paglini, of the International Psychic Center, but it folded shortly thereafter." 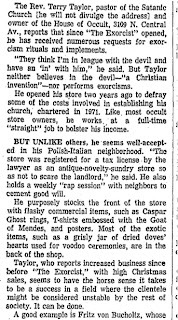 Taylor's store was actually called House of the Occult, located near Belmont and Central Avenue. He did not own the Occult Bookstore. Despite only having been in existence for a few years, Taylor seems to have gotten quite a lot of press. I've found very little regarding his beliefs, or anything incredibly specific regarding The Orthodox Satanic Church (which at one point was known as Thee Satanic Orthodox Church of Nethilim Rite). Still, his name shows up in quite a few publications. "We've had our windows at the House of Occult smashed six times in the last six months," he said. "Salt has been dumped in our gas tanks. We've been threatened twice with a gun. Someone set street gangs on us. We wrote to the Justice Department in Washington, D.C., and now we have police protection." "...(W)e just do not believe that there is a devil. There is an active and a passive section in our minds, but neither is necessarily good or evil, plus or minus." Chicago Tribune - March 8, 1974. "They think I'm in league with the devil and have an 'in' with him," he said. But Taylor neither believes in the devil - "a Christian invention" - nor performs exorcisms. Anyone with more information about Taylor and associated organizations is encouraged to make contact. It's amazing, all this stuff you find - I've been involved in the occult community in Chicago for 20 years and this is all new to me. Thanks! I'm so glad to hear it! I actually read about Taylor long before I moved to Chicago. It was only a couple of weeks ago that he came to mind and I remembered that he was located here. I would love it if I would hear from someone who used to be associated with one of these organizations would contact me to clear some of these things up. I wonder if Terry Taylor is still here in Chicago.